Up until now, email notifications for Google+ were about as useful as an email notification from Google+. All you were able to do was view the content and click through to interact with the post. Yep, it was pretty useless. 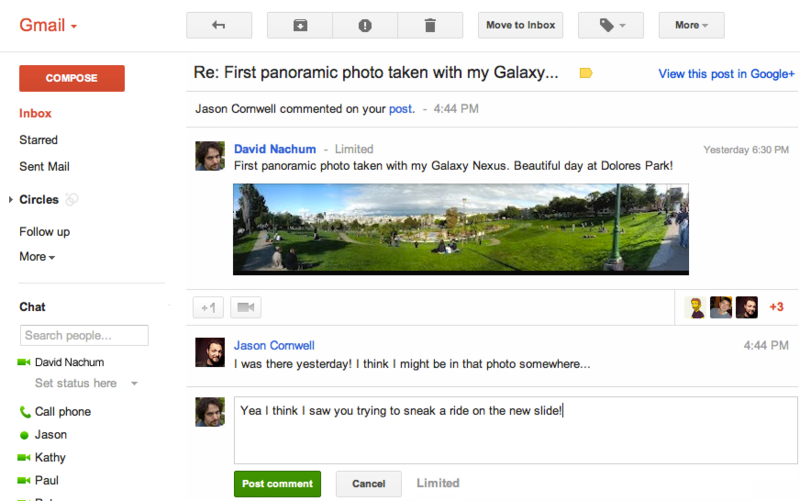 Over time, the Gmail team has added more social functionality, such as Google+ history to its people widgets, along with photo and video thumbnails. Today, the Gmail team has announced that email notifications from Google+ are now fully functional, meaning you’ll be able to interact with the content that you’re sent right from your inbox. I’ve personally turned off the email notifications since they weren’t very useful to me. Google+ is a real-time service and I never really got the point of flooding my inbox with things that I had to click. The fact that I can now interact with the post changes everything and I’ll probably be turning the notifications back on. By letting me +1 or comment on a post from within my inbox, I don’t have to be taken out of my flow to be social. It seems like some of the thoughts behind Wave and Buzz are sneaking their way back into Google products, in a good way. The idea of having a fully interactive and collaborative environment surrounding you at all times is the way of the future. In my opinion, Google is doing an outstanding job of weaving all of its products together without making you change the way you do things.